You may be thinking that since Evan's life is a Non-Stop Parade of Ripping-Good Adventure, I therefore must be throttling back the excitement level in my photos to save you all from having fatal brain funsplosions. Thanks, but that's not the case. This is pretty much my life. Oh, it's not bad. I'm just feeling like I'm running out of things to photograph. I'm sure that's because I'm tired and not getting anything done except going to BHFT and posting these pictures. Anyway, today's Fun Fact* is that in picture #2, the table on the mezzanine closest to the top of the escalator is where I eat my lunch. In fact, you see a close-up in picture #3. So enjoy the photos, and be Excellent to each other! 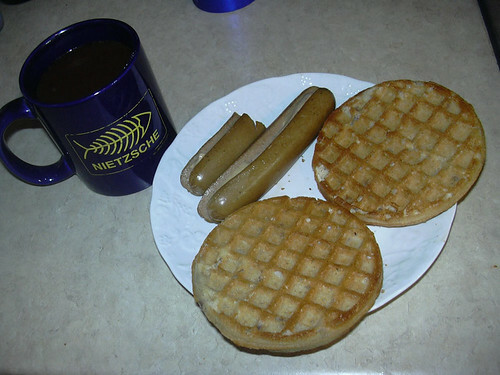 6:15 am - Today for breakfast I'm having Chicken Hot Dogs, Gluten-Free Blueberry Waffles, and coffee. 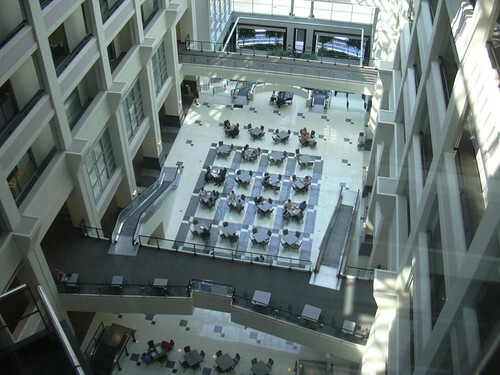 11:40 am – From the glass elevator, looking into the Atrium. 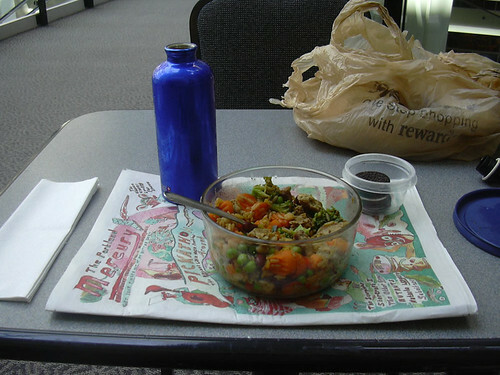 12:51 pm – Today's Lunch: Teriyaki Chicken, with orange mineral water and cookies for dessert, served on a Portland Mercury. 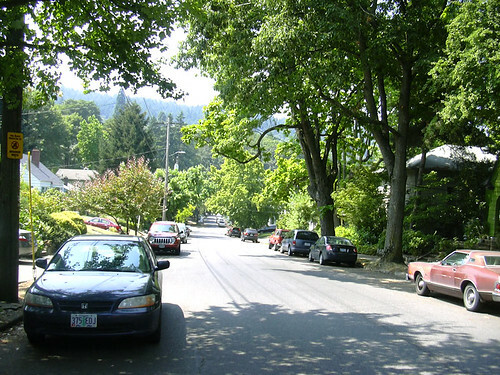 1:30 pm – I forget that there are pleasant streets nearby for my Lunchtime Walk. 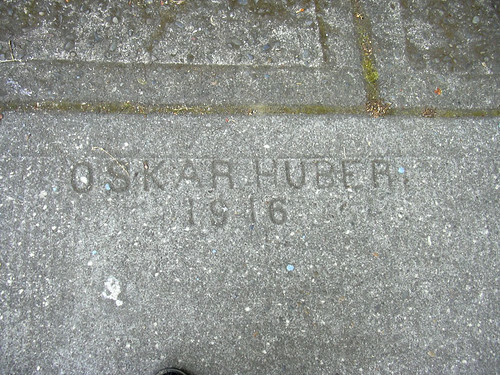 1:32 pm – A hundred years ago, they took their graffiti seriously. 1:39 pm – Apparently not all parents have learned bullet point #3. As required by the Rules, here's Sunday's post, which has the Rules. | Monday's Post. | Tuesday's Post. | Wednesday's Post. 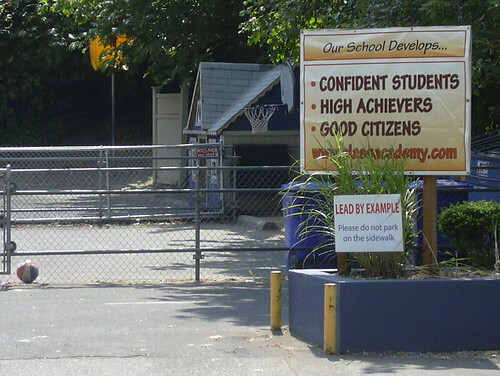 *For certain values of "Fun."